Cabeza Prieta National Wildlife Refuge (CPNWR) is located in southwestern Arizona in the United States, along 56 miles (90 km) of the Mexico–United States border. It is bordered to the north and to the west by the Barry M. Goldwater Air Force Range, to the south by Mexico's El Pinacate y Gran Desierto de Altar Biosphere Reserve, to the northeast by the town of Ajo, and to the southeast by Organ Pipe Cactus National Monument. Located within the Yuma Desert, a lower-elevation section of the Sonoran Desert, the refuge was originally established in 1939 to protect desert bighorn sheep. Today, it is home to more than 275 different species of animals and nearly 400 species of plants. CPNWR is the third largest national wildlife refuge in the lower 48 states. Its total area is 860,010 acres (3,480 km2), which is greater than that of the state of Rhode Island. The refuge is administered from a small headquarters building, located in Ajo. Spanish for "dark head," the refuge's name comes from the Cabeza Prieta Mountains in the refuge's northwest part. 803,418 acres (3,251 km2) — amounting to 93% of the total area of CPNWR — was preserved in 1990 as the Cabeza Prieta Wilderness. Author Edward Abbey, a frequent visitor, described the refuge as "the best desert wilderness left in the United States" and is reputedly buried there. There are only three public-use roads in the refuge: El Camino Del Diablo, Christmas Pass Road and Charlie Bell Road. All of these are unpaved, and they are frequently very difficult to travel because of deep mud and sand, sharp rocks, vegetation, and other obstacles. Four-wheel drive vehicles are required on El Camino Del Diablo and Christmas Pass Road. Charlie Bell Road can be traversed in a 2-wheel drive vehicle, provided the vehicle has a high clearance. There are no facilities on the refuge, including gasoline, sanitation or potable water. Visitors are advised to carry two spare tires and other spare mechanical parts in case of a breakdown. Parts of the refuge are sometimes temporarily off-limits to visitors during training exercises on the adjacent Barry M. Goldwater Air Force Range, or because of law enforcement concerns with respect to illegal trafficking of people and drugs from Mexico. Additionally, parts of the refuge are temporarily off-limits to visitors between mid-March and mid-July, during the fawning season for the Sonoran pronghorn (Antilocapra americana sonoriensis), an endangered species endemic to the Sonoran Desert. The purpose of this closure is to minimize disturbance to herds containing fawns, which can result in the loss of fawns. CPNWR is located within the Yuma Desert, a lower-elevation section of the Sonoran Desert. Despite the harshness of the desert environment, the refuge is home to more than 275 different species of animals and nearly 400 species of plants. Many species of birds are permanent residents of CPNWR, while many others migrate through during the spring and fall. Most of the fauna are xerocoles, and they tend to be either nocturnal or crepuscular, most active at dawn and dusk so as to escape the heat. In 1936, the Arizona boy scouts mounted a statewide campaign to save the desert bighorn sheep, leading to the creation of CPNWR. The Scouts first became interested in the sheep through the efforts of Major Frederick Russell Burnham, the noted conservationist who has been called the "Father of Scouting". Burnham observed that fewer than 150 of these sheep still lived in the Arizona mountains. He called George F. Miller, then scout executive of the boy scout council headquartered in Phoenix, with a plan to conserve them. Several other prominent Arizonans joined the movement and a Save the Bighorns poster contest was started in schools throughout the state. The contest-winning bighorn emblem was made up into neckerchief slides for the 10,000 Boy Scouts, and talks and dramatizations were given at school assemblies and on radio. The National Wildlife Federation, the Izaak Walton League, and the National Audubon Society also joined the effort. On January 18, 1939, over 1,500,000 acres (6,070 km2) of Arizona were set aside at CPNWR and at Kofa National Wildlife Refuge and a Civilian Conservation Corps camp was set up to develop high mountain waterholes for the sheep. A brick and stone monument was erected on a hill near Tule Well, and Major Burnham delivered the dedication speech opening CPNWR in 1941. The desert bighorn sheep is now the official mascot for the Arizona Boy Scouts and the number of sheep in these parks have increased substantially. In 1989, in celebration of the 50th anniversary of this refuge, the stone monument on the site was re-dedicated to the Arizona Boy Scouts and Major Burnham. ^ a b Center for Biological Diversity (2011-05-19). "Cabeza Prieta National Wildlife Refuge Puts Fragile Pronghorn Population at Risk From Motorized Mayhem". Press releases. Tucson, Arizona: Center for Biological Diversity. Retrieved 2014-04-18. ^ Cabeza Prieta National Wildlife Refuge (2013). "About the Refuge". Ajo, Arizona: United States Fish and Wildlife Service, United States Department of the Interior. Retrieved 2014-12-28. ^ a b Cabeza Prieta National Wildlife Refuge (2013). "Wildlife & Habitat". Ajo, Arizona: United States Fish and Wildlife Service, United States Department of the Interior. Retrieved 2014-12-28. ^ Science Applications Team; United States Fish and Wildlife Service (2013). "Bringing Sonoran Pronghorn Back from the Brink" (PDF). United States Fish and Wildlife Service: Southwest Science Applications - Our Stories. Albuquerque, New Mexico: United States Department of the Interior, United States Fish and Wildlife Service, Southwest Region. Retrieved 2014-04-18. ^ Abbey, E (2006). Postcards from Ed: dispatches and salvos from an American iconoclast. Milkweed Press. ISBN 1-57131-284-6. ^ a b Cabeza Prieta National Wildlife Refuge (2013). "Plan Ahead". Ajo, Arizona: United States Fish and Wildlife Service, United States Department of the Interior. Retrieved 2014-12-28. ^ Slivka, J (2003-10-30). "Border Crime Ravaging Parks In Arizona In 'Smugglers Crescent,' Public Is Losing Out As Rangers Are Forced To Act As Border Police". The Arizona Republic. Phoenix, Arizona. Retrieved 2014-12-28. Cabeza Prieta National Wildlife Refuge, southeast of Yuma, has more crimes per visitor than any other piece of public land in the West. ^ Ingley, K (2005-05-15). "Ghost highways - Arizona desert scarred by illegal immigration traffic". The Arizona Republic. Phoenix, Arizona. Retrieved 2014-12-28. Cabeza Prieta National Wildlife Refuge, southeast of Yuma, has more crimes per visitor than any other piece of public land in the West. ^ Cabeza Prieta National Wildlife Refuge (2013). "Fawning Season". Ajo, Arizona: United States Fish and Wildlife Service, United States Department of the Interior. Retrieved 2014-12-28. ^ Powell, TR (2014). "Animals of the Sonoran Desert and Refuge". Ajo, Arizona: Cabeza Prieta Natural History Association. Retrieved 2014-12-28. ^ a b c Edward H. Saxton (1978). "Saving the Desert Bighorns". Desert Magazine. 41 (3). Retrieved 2008-04-27. ^ Steffens, JC; Macomber, RH (1997). "CPNWR - Tule Well". Retrieved June 30, 2013. 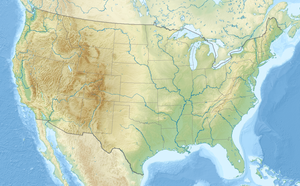 Wikimedia Commons has media related to Cabeza Prieta National Wildlife Refuge. This page was last edited on 24 January 2019, at 17:32 (UTC).